In the previous article on SKINS sportswear we reviewed the A400 series, now we're going to have a quick look on A200 model. In the previous article on SKINS sportswear we reviewed the A400 series, now we’re going to have a quick look on A200 model. Some studies have confirmed that the application of the compression clothing may assist athletic performance and recovery. This is why SKINS sportswear is currently one of the most popular items on the market. The brand’s mission was to design the clothing line that would help athletes recover faster and be more effective at their sport. A400 series were made for elite and recreational athletes who do more than 10 hours of sports per week. The new A200 Active range is designed for everyday athletes who spend up to 10 hours a week running, cycling, walking or just training in the gym. They were designed by studying both, the professional and amateur athlete`s needs, range of motion and body shapes. They feature a so called dynamic gradient compression which can improve athlete`s blood circulation and oxygen delivery by selectively distributing the correct level of pressure on the body. Which means that the lactic acid removal can be formed more rapidly, recovery period can be shorter and your muscles can restore faster. Biomechanically placed Memory MX fabrics in the clothing provide controlled compression and support which can help athletes lower the risk of muscle damage during performance. SKINS A400 series can also help regulate the body`s temperature and keep your body dry: transport the moisture away from the skin. Studies suggest that the application of compression clothing may assist athletic performance and recovery by increasing muscle oxygenation, reducing exercise induced muscle damage and perceived muscle pain: blood lactate removal. Some studies on compression garments effect on balance even concluded that a proper fitted compression sportswear may assist injury management, rehabilitation and prevention. Dynamic gradient compression which can improve the body`s blood circulation and oxygen delivery. Sun protection factor of 50 +. 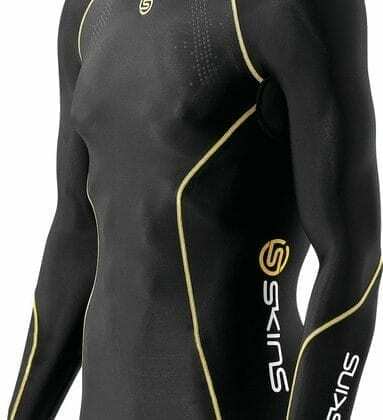 Just click here to get your Skins A200 compression wear now! Give it a try and give us some feedback on how you like it! 1. Jakeman JR, Byrne C, Eston RG, Lower limb compression garment improves recovery from exercise-induced muscle damage in young, active females, European Journal of Applied Physiology, August 2010, Volume 109, Issue 6, pp 1137-1144. 2. Pruscino CL, Halson S, Hargreaves M, Effects of compression garments on recovery following intermittent exercise, Eur J Appl Physiol. 2013 Jun;113(6):1585-96. doi: 10.1007/s00421-012-2576-5. Epub 2013 Jan 12.